Demand Charges are based on the “PEAK USAGE” of electricity that is consumed at an electric meter. Your electric bill will also include Consumption Charges which are the total energy (kWh) consumed through the meter. Demand Charges (kW): the maximum amount of power (kW) drawn for any given time interval (typically 15 minutes) during the billing period, multiplied by the relevant demand charge ($/kW). Consumption Charges (kWh): the amount of energy (kWh) consumed, multiplied by the relevant price of energy ($/kWh) during the billing period. Why do Demand Charges Even Exist? Operating and maintaining the grid is not cheap. Demand charges cover the electric utilities’ fixed costs of providing a specific level of energy to their customers. Consumption Charges are the variable-costs portion (#2 above). The challenge is that utilities have to maintain enough electrical capacity to satisfy all their customers’ energy needs at once (e.g., a hot day in August when every customer runs their AC). How are Demand Charges Calculated? Higher demand charges are allocated to those consumers (residential or commercial) that consume a higher value energy (kW) within a 24 hour period. Depending on your utility, there will be rules as to how high your load (kW) must be before the demand charges kick in. The lowest demand charges are seen for those customers that have a constant steady load profile. Remember Demand Charges are the price of a standard kWh unit plus an additional tax for going over the demand limit. So if your standard kWh price is 1 then you might pay 1.2 (or more) for that same kWh after you have initiated the demand charges. This added taxation will depend on the utility and the system they have in place. Solar power is a very effective way at offsetting energy usage charges, but less helpful in lowering demand charges which are triggered by spikes in demand at any time over the course of a day/month. Combining solar PV with battery-storage (including a local control system for site loads) may provide an effective method of lowering a business’ overall electric bill (both demand charges and electric usage charges). Demand charges make up a significant portion of commercial and industrial customers’ total electricity costs and we now see this being applied to residential customers as well. The good thing is that solar energy systems have become very inexpensive and allow users to at least cut their Energy Consumption Charges. Adding batteries with the solar PV system could allow users to cut both Demand and Consumption Charges. Access Charges are often seen as its own line item on an electric/utility bill and relate the recovery of some of the fixed costs that come directly from serving a metered customer. This charge comes regardless of how much electricity is used and the costs include the cost of the meter, wire and other equipment used to deliver electricity to the home or business, as well as billing expenses such as meter reading, bill preparation, and postage. There are a variety of different tariff rates offered by utilities. Common rates are the single rate tariff and the time of use tariff. Single rate tariffs: you pay the same price for electricity regardless of what time of day you use it. Remember, energy retailers still refer to these prices as ‘peak usage’. This is especially true if you have a controlled load whereby you pay for hot water heating or your pool pump at a reduced rate. Time of use tariffs: you pay different prices for electricity depending on what time of day you use it. 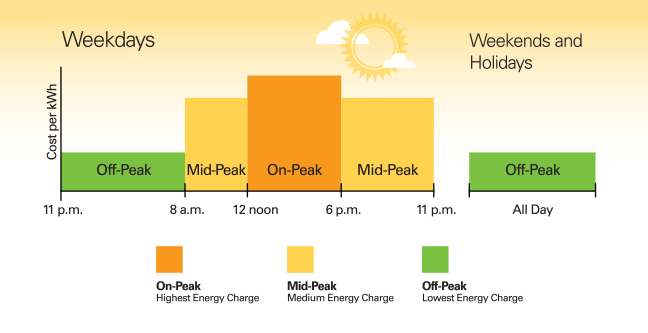 In this situation, the ‘peak usage’ component of your bill will reflect the amount of energy used during peak usage times (check with your utility to find out what these times are). Remember, if you have a single rate tariff, you could easily get confused and think you pay different rates for power at different times of day. Your not, and you don’t need to change your electricity usage patterns to get better pricing. If you’re not sure which tariff you’re on, check your bill or contact your energy retailer.